Union Petroleum and Natural Gas Minister Dharmendra Pradhan, Piyush Goyal and agriculture minister Radha Mohan Singh briefed the media on almost every issue but refrained themselves on talking about the constant hike in fuel prices. Pradhan is being accompanied by Railway Minister Piyush Goyal and Union Agriculture Minister Radha Mohan Singh. Union Petroleum and Natural Gas Minister Dharmendra Pradhan, Piyush Goyal and agriculture minister Radha Mohan Singh briefed the media on almost every issue but refrained themselves on talking about the constant hike in fuel prices. Pradhan is being accompanied by Railway Minister Piyush Goyal and Union Agriculture Minister Radha Mohan Singh. Pradhan on Saturday said that fuel price hike in the country is due to the strong dollar and stress on oil production in Iran, Venezuela and Turkey, adding that these factors aren’t in India’s hands. The minister further claimed that Indian currency is stronger in comparison to all other currencies. His statement came a day after he supported the idea of bringing petrol and diesel under Goods and Services Tax (GST). The Indian National Congress on Monday launched a sharp attack on the NDA government accusing PM Narendra Modi of failing to deliver on the promises made to the country and called a nationwide bandh. Along with Opposition parties like DMK, NCP, RJD, JDS, Congress launched a nation-wide protest against the rising fuel prices and a weak rupee. Earlier, Union Finance Minister Arun Jaitley had clarified on the issue, adding that due to two major external factors, this unavoidable situation is there in the market. American Dollar is creating a unique and unavoidable situation which is not good for world’s economy also, he said while responding to a question. Modi government launches Pradhan Mantri Anndata Aay Sanrakshan Abhiyaan (PM-AASHA) for the welfare of Farmers. 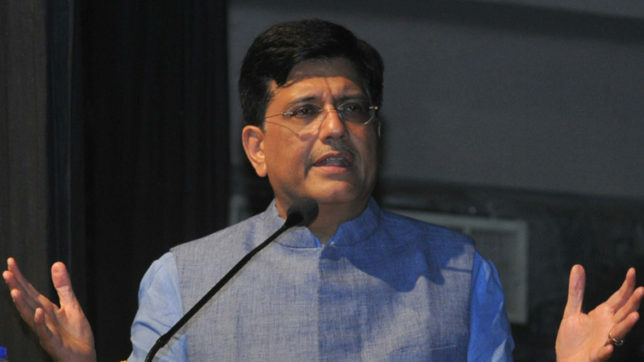 Piyush Goyal said that the Cabinet Committee On Economic Affairs has approved electrification of remaining un-electrified broad gauge routes of Indian Railways. A tweet from Central Railways said that the electrification will result in greater savings and efficiency due to 100% electrification on Indian Railways. Reduced fuel bills; cost efficiency in conversion and reduced cost of maintenance. Addressing media over the fule hike price, Piyush Goyal said that 4 NIDs will be set up which will later become the institution of national importance. Addressing media from BJP HQ, 6A Deendayal Upadhyay Marg, Union Minister Dhramendra Pradhan said the government is taking all the necessary steps to free the masses from the pressure of hike in fule price.